Dieffenbachia, otherwise known as dumb cane, comes in a lot of varieties, all of which make great houseplants. This is a houseplant that can live and thrive easily, but it's known for some toxicity to human and pets. So even though it makes a beautiful tropical look to your house just like the Prayer Plant, Dracaena Corn Plant, Peace Lily, etc. you'll need to have good knowledge of how to care it, which I'll go into details in this article. Dieffenbachia plants will benefit from generous watering followed by a short period where the soil is allowed to dry out partially. Between watering, check the soil to see if it is due for another watering. The top inch of the soil should be dry, while everything below that will still be moist. If the top layer of soil has dried out, then you can give the plant another generous watering and repeat the cycle. The frequency with that you need to water your Dieffenbachia will depend upon the variety you have, the size of the plant, the season, and the conditions in which you are growing it. Generally speaking, the plant will need much less water during the winter months (Missouri Botanical Gardens). The Dieffenbachia grows from March to October, so you can expect the plant to require more frequent watering during this time. Like all houseplant, the Dieffenbachia is susceptible to root rot. Root rot is the result of overwatering, so your best line of defense is prevention. Pay close attention to the condition of your plant's soil before watering. Ensure the plant is in well-draining soil and that the pot has drainage holes in the bottom. Check regularly that drainage holes do not become blocked, and remove any water collecting in the drip tray after you have watered it. The easiest way to prevent accidental overwatering is to follow our guidelines whereby you check that the top layer of soil is dry before adding further water to the plant. This method will increase your chances of a healthy and thriving plant. This plant does well in a variety of lighting situations, from light shade to bright indirect light. The leaves will be at their most vibrant when the plant receives a good amount of bright, indirect light, though any direct light should be avoided as this can burn the leaves or cause the foliage coloring to look bleached or faded. The Dieffenbachia would ideally like to be in bright light that is filtered through sheer fabric, or another type of window covering that will allow light to pass through it. Although Dieffenbachias prefer bright light, they will do just fine in moderate light or even partially shaded environments. Though a shaded area isn’t recommended for this plant, if it finds itself in a dark corner, it will manage to stay alive and maintain a healthy appearance, but it will stop growing. Given the plant's adaptability to a variety of lighting conditions, it makes for a good easy-care houseplant in most homes and offices. Dieffenbachias are also a good choice to brighten up dull commercial spaces as they can survive entirely on artificial light. The Dieffenbachia likes high humidity and will thrive in humid conditions. Because of this, the plant does especially well when kept in kitchens and bathrooms that tend to be quite humid. As well as keeping your plant happy, providing high humidity is also an easy way to deter some pests. Spider mites tend to latch on to houseplants when the air is dry, so maintaining a humid environment should help to prevent you from having to deal with this problem. Most homes are not naturally humid places, but you can easily increase the humidity for your plants in various ways. Spraying plants frequently with a light mist of water will increase the humidity, and this also has the added benefit of keeping dust from settling on the leaves. Another way to increase humidity is the use of a rock tray. Sit your Dieffenbachia plant on a tray that is covered in rocks or pebbles, and then, cover the pebbles with water. As the water evaporates, the air around the plant will become more humid. Humidity will also be increased by grouping plants together. You could also use an electric humidifier to battle dry air. 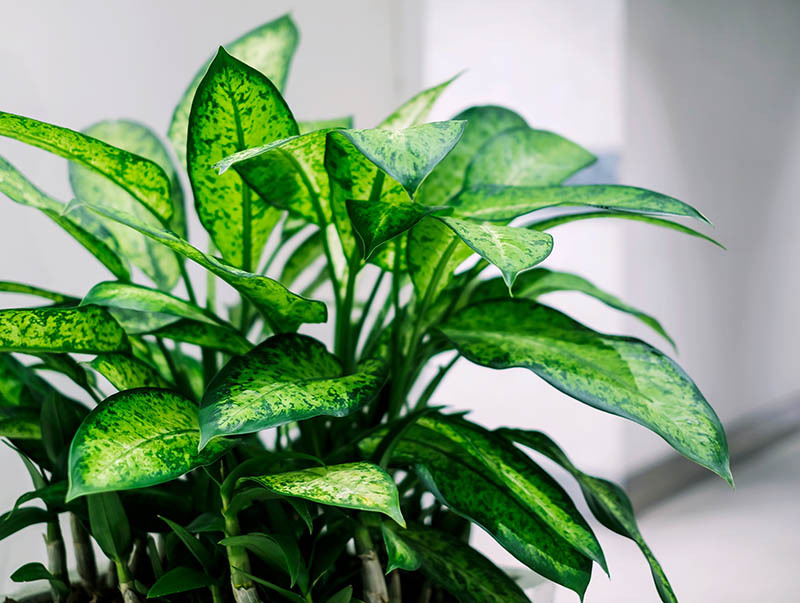 Although the Dieffenbachia plant prefers humid conditions, it usually does just fine in average humidity found in homes. 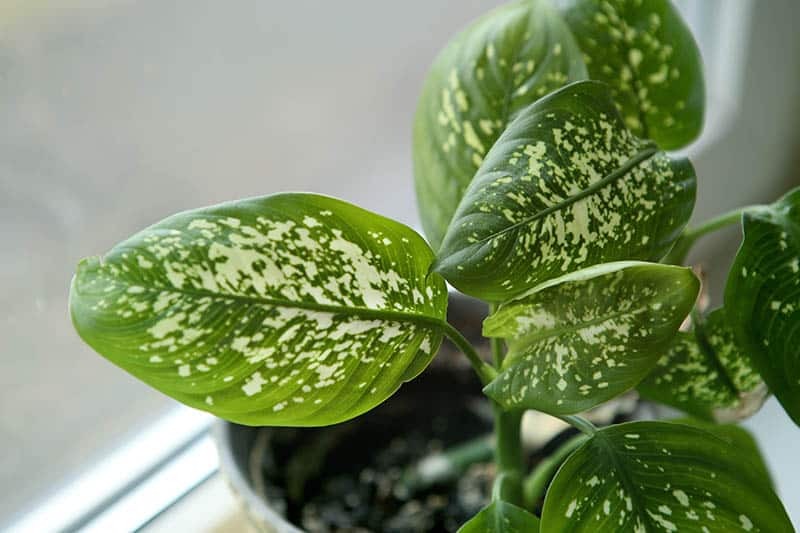 Keep an eye on the Dieffenbachia and take note if your plant starts to react badly in a low humidity environment, as you may need to address the issue. Also, be on the lookout for spider mites on your plant in low humidity. This houseplant likes to be kept cozy and warm. Ideally, it should be in the temperature range of 60° F-80° F at all times. A few degrees outside of this on occasion should not cause a problem, but frequent cold drafts will result in stunted growth and damage to the foliage. Excessively high temperatures should also be avoided, as this will lead to a weak plant. Keep your Dieffenbachia away from any areas that might see a temperature drop, such as near doorways or in disused rooms that don’t get heated through the winter. Also, avoid areas that get too hot, such as sunrooms or locations near heaters. Pruning a Dieffenbachia isn’t essential, though you may wish to tactically prune it to encourage a shape you like. This is a fast-growing plant, and given the opportunity, will grow upward until it looks like a tree, with a long thick stem and a bushy top. Most people prefer their Dieffenbachia to have more of a compact, bushy style, so you can achieve this by pruning it to encourage outwards rather than upward growth. If you are inexperienced with pruning, there’s no need to worry about going wrong with a Dieffenbachia. It is a very forgiving plant, and even if you over prune it, you will find in a very short time that it is once again full and bushy. This is one of the great features of the Dieffenbachia because if you ever need to, you can completely cut it back to just a short stem and it will regrow to a lush plant in a relatively short space of time. This might be an option if the plant suffers from a disease or has stem rot from the top. Healthy cuttings that result from pruning do not need to be wasted and can be used to propagate more Dieffenbachia plants in your home. Dieffenbachia plants should be repotted with caution. If you give your plant more space to grow its roots, then it will also begin to require more space outside of the pot. Many varieties of Dieffenbachia can grow to ceiling-height quite rapidly, so if you would prefer to keep your plant compact, then you will need to keep it in a restrictive pot. If you do go ahead and repot your Dieffenbachia, wear protective gloves with long sleeves, as the sap contained in both the leaves and the stem is a poisonous irritant that can cause pain and discomfort if it comes into contact with skin. If you do get the sap onto your skin, wash thoroughly and avoid touching your mouth or eyes. Dieffenbachia plants are easy to propagate with cuttings, so from a healthy mother plant, you could have an endless supply of new Dieffenbachias. The simplest way to propagate this plant is with a stem cutting or tip cutting. To get a stem cutting, locate the main chunky stem of the plant and cut off a two-inch piece with a sharp razor or pruning tool. Wear protective gloves and eyewear, as the sap could easily find its way onto you and cause pain and discomfort. Be sure to keep the stem cutting the correct way up, as if it is potted upside down it won’t root. You can dip the cut end of the stem in rooting hormone to encourage root growth, though, generally, Dieffenbachia plants will successfully root without this step. Meanwhile, fill a small and shallow pot with a rooting medium and ensure that it is watered to the point of being moist. Make a small hole in the soil with a fingertip or pencil, and place the stem cutting into the hole with the cut side facing down to the bottom of the pot. Half of the cutting should be buried in the soil, and half should be sticking out. Pack the soil up against the cutting to make sure it is securely in place. Put the pot in a warm spot, ideally with bottom heat, and wait for the cutting to root. The length of time this takes will vary depending on the variety of Dieffenbachia you have, but it will be between three and eight weeks. Once the cutting has several new shoots of its own, you can pot it into a more permanent home and continue care as usual. You can also propagate with offshoots from the main stem. Cut a length from the mother plant of around six inches and remove all leaves on it. You can then root this in a rooting medium as above, or you can propagate it in water. To propagate in water, you simply need to place the cutting in a glass or jar of water. The jar should be about half the height of the cutting so that plenty of the cutting is sticking out of it. Place the jar in a warm spot with bright indirect light, and wait for roots to grow. You will need to change the water in the glass when you notice it becoming dirty or discolored, as the water must be kept clean. Propagating in water is quite fascinating because you can visually keep track of every stage of the new roots growing, which is something you don’t get to witness when propagating in a rooting medium. Once the cutting has a few small roots, you can transfer it to a pot filled with well-draining soil and continue usual Dieffenbachia care. Be sure not to allow the cutting to grow too many long roots in the water, as this can make it very difficult to pot successfully. This plant gets its common name of ‘dumb cane’ from its ability to leave a victim speechless or struck dumb. The Dieffenbachia sap contains calcium oxalate crystals called raphides. The raphides are minuscule, needle-shaped crystals that can cause severe reactions when they come into contact with skin or tender tissue found in the mouth or eyes. The sap, which is found in the stem, leaves, and even the roots of the plant, is poisonous to both humans and animals, though reactions in humans tend to be milder and not life-threatening. 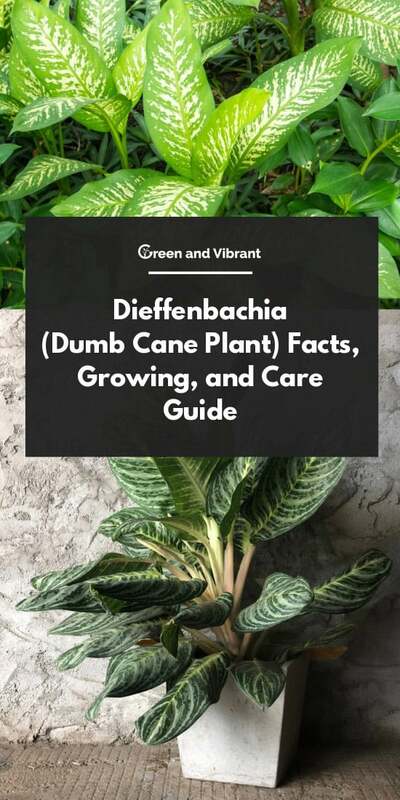 If a human, most commonly a young child, has nibbled on the Dieffenbachia, they may encounter symptoms such as a burning sensation on the lips, tongue, inside the mouth, or in the throat. Blistering can also occur inside the mouth, along with hoarseness, pain when speaking or swallowing, and a refusal to eat. In the past, the plant was actually used as a means of torture (Canadian Biodiversity Information Facility). Fortunately, as the sap gives a burning sensation as soon as it touches the mouth or lips, it’s very rare that anyone continues munching on it and ingests a large amount. If your child does ingest some of the plants, the most common side effects will be vomiting, diarrhea, nausea, and tummy ache. Contact with skin and eyes is also problematic and can cause long-term damage to the corneas. Side effects of getting the sap on your skin will likely include an itching or burning sensation, and redness. These issues usually resolve within a few days, but can sometimes last several weeks. This variation of the Dieffenbachia plant is popular in homes and offices because it does well in dim conditions with very little light. The leaves are smaller than some of the other varieties, growing to around 12 inches in length. The foliage base color is green, with deep green margins between the white colored veining. This is an especially bushy-looking variety, with a habit to grow very densely so that the stem is no longer visible. 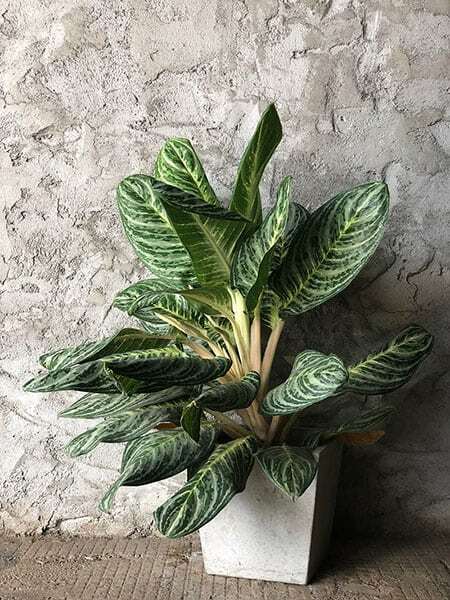 The foliage of this variant is fairly small for a Dieffenbachia, with lengths of around 10 to 12 inches. 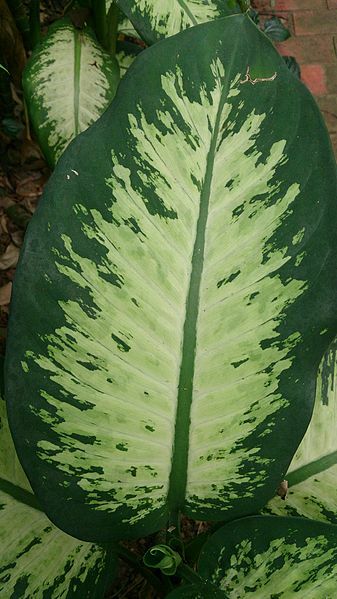 Also known as the spotted dumb cane, this variety has tropical looking green leaves with vibrant white spots on them. Grown outside, the plant can reach heights of six feet, but this can be limited with pruning when kept as a houseplant (University of Florida- Institute of Food and Agricultural Services). This cultivar of Dieffenbachia maculata, as the name suggests, is a more compact plant. Its growth will be full and dense and will make an ideal tabletop plant rather than a floor plant. It has green leaves with creamy middles and green edges. It can grow to a maximum of three feet tall. This cultivar is another compact plant, growing up to three feet tall. 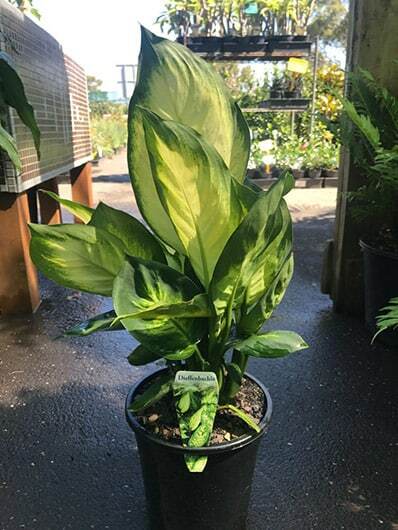 The leaves on this Dieffenbachia are large, with lengths of up to 16 inches. Similar to the Compacta, the plant is full and dense, giving a very lush look. The foliage is pale yellow with vibrant green edges. This larger Dieffenbachia has very stunning foliage. The leaves are a base color of silver and feature green and white spots. This cultivar has some of the smallest leaves found on a Dieffenbachia, of around seven inches long. The leaves have white veins on a bright green and pale green variegation. The foliage on this cultivar is quite different from the others. The leaves are very pale green with random specks of dark green and white splashed across them. The leaves almost appear as if the paint has been flicked all over them. This variant has large, broad leaves that are predominantly a creamy pale green color. The leaves edges are dark green, giving a very contrasting outline to the foliage. This variety grows even more quickly than your average Dieffenbachia, so it may need to be pruned more frequently to prevent overgrowth. The leaves are a pale greenish yellow with dark green edges and flecks. This cultivar has dark green leaves that feature flecks of pale green. It is one of the larger varieties of Dieffenbachia, working well as a floor plant. Another of the larger varieties, this plant has large broad leaves. Foliage is predominantly a creamy pale yellow, edged in dark green with small dark green spotting where the two colors meet. This variety received its name from the small cream and white spots on the leaves that resemble falling snow. On a background of dark green, the resulting effect is quite unique. Growing up to six feet tall, this is a large-growing variant. This appropriately named variety of Dieffenbachia grows to be quite large, with big broad leaves. The foliage is mostly a golden yellow color, with a contrasting bright green edging. The bright and bold colors of this plant make it perfect for bringing fun and vibrancy to a dull corner of a room. Which variety do you like best? Let us know in the comments, and feel free to ask any questions you might have about your Dieffenbachia!